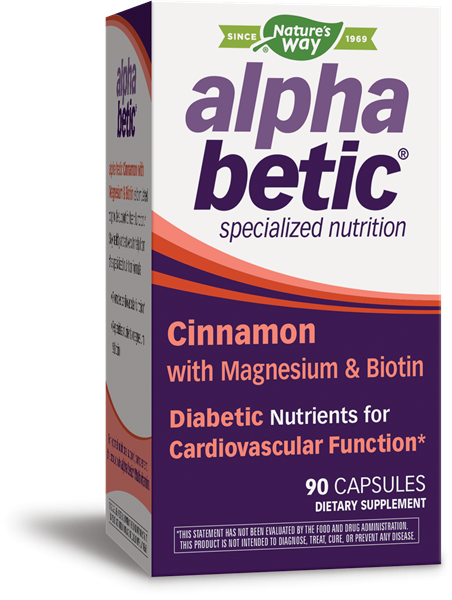 alpha betic Cinnamon with Magnesium & Biotin / 90 capsules - Nature's Way®. Why should people with diabetes use a supplement? This formula provides 1,000 mg of cinnamon bark, 200 mg of magnesium, and 300 mcg of biotin. Having all three nutrients makes it convenient and more cost effective than single ingredient products. alpha betic® formulas are specially balanced to meet the nutritional needs of diabetics. Caution: People with diabetes should monitor blood glucose levels regularly. If pregnant, nursing or taking any medications, consult a healthcare professional before use.